February 12, 2010 - Two state-of-the art solar instruments built at the Solar and Astrophysics Laboratory of the Lockheed Martin Advanced Technology Center (ATC) in Palo Alto, were launched aboard a United Launch Alliance Atlas V rocket. The Atmospheric Imaging Assembly (AIA), a suite of four telescopes, will provide an unprecedented view of the solar corona. Taking images that span at least 1.3 solar diameters in multiple wavelengths nearly simultaneously, at a resolution of about one arc-second and at a cadence of ten seconds or better. The Helioseismic and Magnetic Imager (HMI), designed in collaboration with Professor Philip Scherrer, HMI Principal Investigator, and other scientists at Stanford University, will study the origin of solar variability and attempt to characterize and understand the Sun’s interior and magnetic activity. The AIA will produce data required for quantitative studies of the evolving coronal magnetic field, and the plasma it holds, both in quiescent phases and during flares and eruptions. The primary goal of the AIA Science Investigation is to use these data, together with data from other SDO instruments and from other observatories, to significantly improve our understanding of the physics behind the activity displayed by the Sun's atmosphere, which drives space weather in the heliosphere and in planetary environments. Ultimately, it is hoped that the greater understanding gained of the observed processes will guide development of advanced forecasting tools needed by the user community of the Living With a Star (LWS) program. "HMI combined with our partner instruments on SDO – the Atmospheric Imaging Assembly and the Extreme Ultraviolet Variability Experiment – will provide us with the data needed to first learn if predictions of solar activity are possible,” said Professor Scherrer. “Then, if we and our colleagues in the solar physics community are clever enough, we’ll actually develop forecast methods. This is an exciting time for studying the Sun and its impact on the Earth." The primary goal of the HMI investigation on SDO is to study the origin of solar variability and to characterize and understand the Sun’s interior and magnetic activity. Because of the turbulence in the convection zone near the surface, the Sun is figuratively ringing like a bell. By studying these oscillations of the visible surface of the Sun, considerable insight can be gained into the processes inside. In effect the solar turbulence is analogous to earthquakes. In manner similar to how seismologists can learn about the interior of the Earth by studying the waves generated in an earthquake. HMI’s helioseismologists learn about the structure, temperature and flows in the solar interior. HMI will produce data necessary to determine the interior sources and mechanisms of solar variability and how the physical processes inside the Sun are related to surface magnetic field and activity. Because HMI can measure the strength and direction of the magnetic field on the surface, more precise estimates of the coronal magnetic field are possible. In addition, HMI observations will clarify the relationships between internal solar dynamics and magnetic activity, providing a better understanding of solar variability and its effects. The knowledge gained will enable a major advance in the development of a reliable predictive capability for solar flares and coronal mass ejections. Solar scientists will use the third instrument on SDO – the Extreme Ultraviolet Variability Experiment (EVE) – to measure the Sun’s brightness in the most variable and unpredictable part of the solar spectrum. The extreme ultraviolet, or EUV, ranges in wavelength from 0.1 to 105 nm. EVE will collect spectra over a broad EUV to UV range from the entire Sun. EVE and AIA will be able together to establish how local events like flares affect the entire solar spectrum. The goal of SDO is to understand – striving towards a predictive capability – the solar variations that influence life on Earth and humanity’s technological systems. The mission seeks to determine how the Sun’s magnetic field is generated and structured, and how this stored magnetic energy is converted and released into the heliosphere and geospace in the form of solar wind, energetic particles, and variations in the solar irradiance. Flying in a geosynchronous orbit, SDO will observe the Sun 24 hours a day without interruption, and downlink its data to the Science Operations Center at Stanford University. Quick look data will be available in near real time for assessment of current solar weather. Processed data will be available to both scientists and the general public as soon as its quality can be evaluated – usually on the order of a day. Public tools for searching the SDO database and for creating a variety of movies will be available. SDO is the most advanced spacecraft ever designed to study the Sun and its dynamic behavior. SDO will provide better quality, more comprehensive science data faster than any NASA spacecraft currently studying the Sun and its processes. SDO will unlock the secrets of how our nearest star sustains life on Earth, affects the planets of our solar system and beyond. SDO is the first mission and crown jewel in a fleet of NASA missions to study our Sun. The mission is the cornerstone of a NASA science program called Living With a Star (LWS). The goal of the LWS Program is to develop the scientific understanding necessary to address those aspects of the Sun and solar system that directly affect life and society. SDO will study how solar activity is created and how space weather results from that activity. Measurements of the Sun’s interior, magnetic field, the hot plasma of the solar corona, and the irradiance will help meet the objectives of the SDO mission. SDO is managed by NASA’s Goddard Space Flight Center for the agency’s Science Mission Directorate at NASA Headquarters in Washington DC. 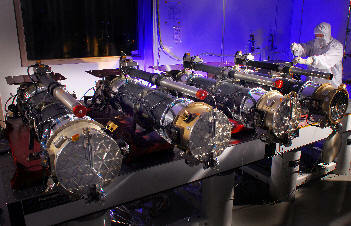 The Solar and Astrophysics Laboratory at the ATC has a 47-year-long heritage of spaceborne solar instruments including the Soft X-ray Telescope on the Japanese Yohkoh satellite, the Michelson Doppler Imager on the ESA/NASA Solar and Heliospheric Observatory, the solar telescope on NASA’s Transition Region and Coronal Explorer, the Solar X-ray Imager on the GOES-N and O environmental satellites, the Focal Plane Package on Hinode and an Extreme Ultraviolet Imager on each of the two spacecraft in NASA’s Solar Terrestrial Relations Observatory. The laboratory also conducts basic research into understanding and predicting space weather and the behavior of the Sun including its impacts on Earth and climate. The ATC is the research and development organization of Lockheed Martin Space Systems Company (LMSSC). LMSSC, a major operating unit of Lockheed Martin Corporation, designs and develops, tests, manufactures and operates a full spectrum of advanced-technology systems for national security and military, civil government and commercial customers. Chief products include human space flight systems; a full range of remote sensing, navigation, meteorological and communications satellites and instruments; space observatories and interplanetary spacecraft; laser radar; ballistic missiles; missile defense systems; and nanotechnology research and development.